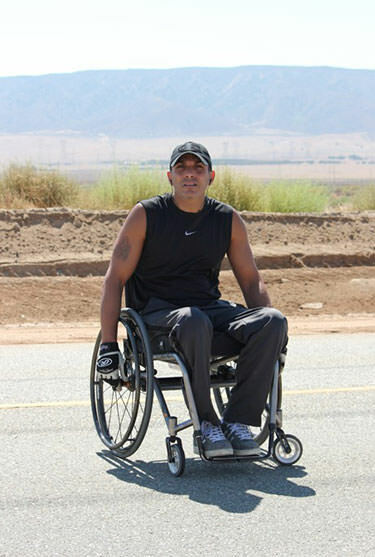 He believes that people in wheelchairs can be athletes. He believes that people with cognitive challenges can be athletes. And he believes that even women in their 50′s can be athletes… get my drift!? He is so committed to this belief that he has decided prove it to the world and raise awareness for people with disabilities by pushing his manual wheelchair across the country, literally from sea to shining sea. His “posse,” a film crew lead by director Lisa France, will be there throughout his journey—from California to New York—chronicling Gabriel’s amazing feats in a documentary entitled ROLL WITH ME. 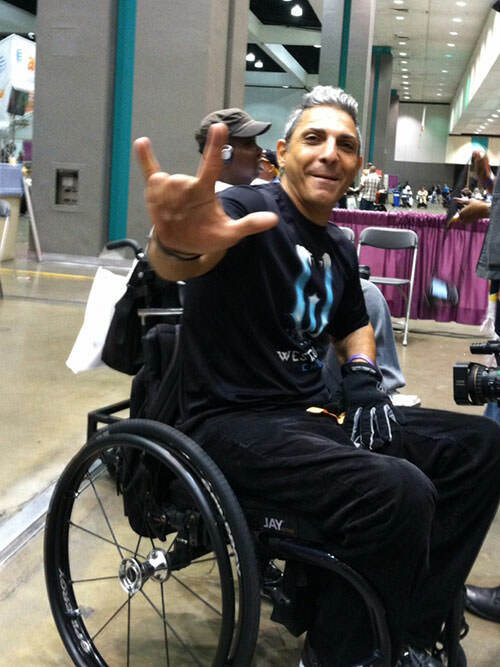 This photo, taken at the Los Angeles Abilities Expo in March, shows Gabriel and his friends right after he had finished scaling a rock wall with no assistance in less than 40 seconds. This was faster than anyone that day…or maybe ever. The key component in this movie is that the stars are a man and his wheelchair. The setting will be the roadways of the continental United States. Gabriel, who launched his incredible trek on March 30 from the Santa Monica Pier, plans to roll into his old homestead of Hempstead, New York and arrive at Jones Beach 75 days later. Just in time, might I add, for his 25th high school reunion. Now, THAT is an entrance! So far, he has traveled through California and Arizona across the arid deserts and is currently, as of the end of April 23 (Day 22), in Denning, New Mexico. (You can follow Gabriel’s route here.) He met extraordinary people, such as people in a small town in New Mexico who fed, lodged and contributed for gas to the film crew’s donated RV. Soon, he will venture into the farmland of the Texas, Oklahoma, Missouri. He has been challenged by the weather and fatigue that one inevitably must endure during a challenge of this magnitude. But, he continues on. Gabriel’s goal is simple: Inspire kids and adults with personal challenges. He hopes that people will ride alongside him in their wheelchairs, bikes, scooters or skateboards. I hope you will want to be part of this magical journey, too! Here is what YOU can do to be part of TEAM ROLL WITH ME! CONSIDER DONATING food, an afternoon to meet and roll alongside Gabriel on your bike, scooter, skateboard, etc. Also, some $$ to help with expenses would be greatly appreciated. ORGANIZE YOUR GROUP TO HELP: Such as Boy Scouts, Girl Scouts, Church Groups, CERT/EMS groups, Dairy Cooperatives, Farm Cooperatives, Local Film Societies and more! 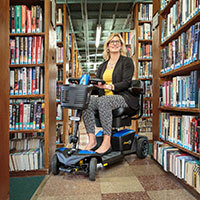 One Man + Wheelchair + Documentary Film Crew + 3300 Miles Across America = ROLL WITH ME! Louise Sattler, NCSP is a nationally recognized guest speaker who melds her life as a psychologist with her passion for sign language. Known for her infusion of humor in to her live presentations and media engagements, she can make learning fun! In addition, she is the owner of Signing Families™, a School Psychologist, an Expert Contributor to the JustAsk! Forum on Education.com and a founding member of the 411Voices media network. Learn more about her work at www.SigningFamilies.com.